Office 365 Online is a lightweight, browser-based office suite that includes all the familiar Office software. 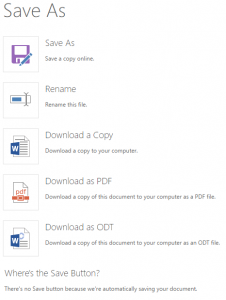 You can access it from any computer without a local copy of Office needing to be installed. 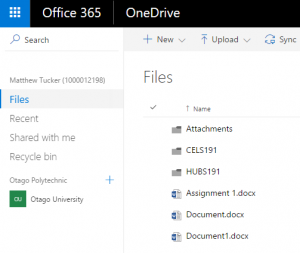 All files are saved to your OneDrive, where you have 1TB of free online storage included with your University account. 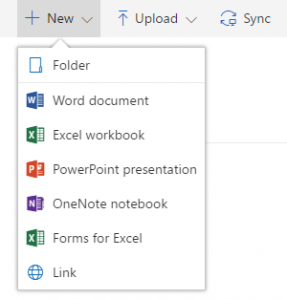 Office 365 Online gives you the ability to work as a group on a single document, share notes with your peers, and schedule tasks and calendar events. Name the file and click Save. The file is saved into your OneDrive. Any file can be dragged into a folder, just like in the desktop version. Clicking on a file will open up the file in the correct application for editing.